Wales Offline Map application developed Golden Forge, Inc.
Golden Forge Offline Maps is the app set of different geographical areas around the world. 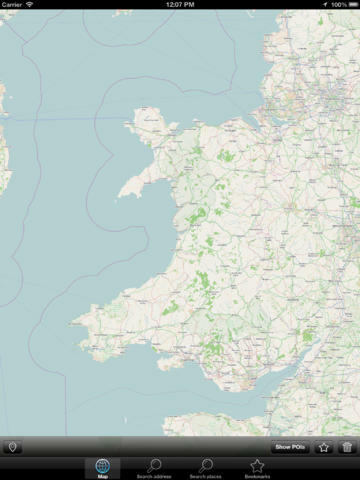 This mobile offline map application of Wales is ready to go: just install and this map is always with you whether you are connected or not. High-detail map with many points of interest, such as hotels, museums, restaurants, shops, parks, viewpoints, banks. Or search for any street or place of interest by name. 1. High-detail map of Wales. 3. Compass feature and detailed route to destination. 4. Add locations to the 'favorites' (bookmarks). 5. Easy to use, no map downloads required, all data is packed in the app. 6. Works entirely without internet connection. No data costs. No roaming expenses. 7. Local Search, which offers easy-to-find information on restaurants, banks, parking lots, subway station and other useful facilities in your neighborhood. 8. Alphabetic street index - address search (by street name & house number). 9. Minimal permissions. No access to your private phone data (apart from your GPS location). 10. No ads. No additional in-app-purchases required. By selecting a map area you can search around any point in the map to find the closest points of interest.